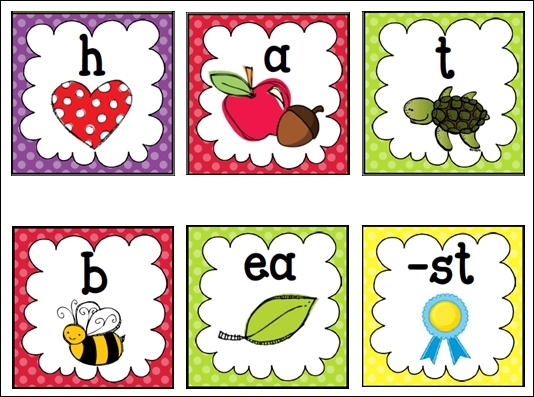 Yesterday I posted my new phonics cards that I am so excited about! I have them all printed out, waiting to be laminated at school! I had a question about the order I teach phonics skills in, so I thought I would share that with you as well! 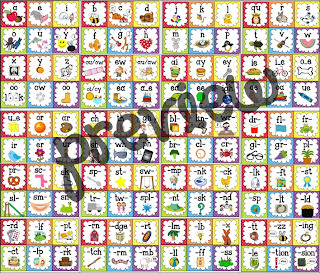 If you want to check out my phonics cards, click the picture below. I have also created a preview that shows all 120 cards included in the pack. Each card is approximately 3.5"x3.5". I find that this really helps students with sounding out words in their writing. If they are writing "big" and get stuck on the /i/ sound, I might remind them of the action to help them figure out the letter. It works great! After a few weeks of the consonants and short vowels, I add in the common digraphs (sh, ch, wh, and th). I refer to the pictures a lot. /ch/ sounds like cheese. /sh/ sounds like shhhhh! I also introduce -ing right away as well, because this is a very common ending in the early guided reading books. I also add in the soft/hard c and g sounds too. Then I get into beginning/ending blends. I might spend a week working on a few that go together (like br, cr, dr, fr). I introduce a few new cards into the pile at a time. I keep doing the cards in the same fashion--I say "s-h says /sh/", then the kids echo--but with all the new cards I introduce as well. I might not do it everyday, but a few times a week. We will usually do some sort of phonics work to go with it as well (Abby has a great word work packs and an awesome blends pack). I usually stick with the short vowels and beginning/ending blends until about Christmas time. After Christmas I focus on the long vowel sounds. I usually teach the two big "rules"--silent e and when two vowels go walking. This usually covers most long vowel pairs. Now, this doesn't mean I don't mention silent e before this. When I'm modelling writing during a writer's workshop mini-lesson, I say outloud everything I am thinking. So I talk about silent e, two vowels, oi/oy, etc. even if we haven't really "learned" them yet. This sets the foundation and helps the students who are ready to try these things in their reading or writing. Once I have spent time on the long vowels, I get into the r-control words (or/ar/er/ir/ur). Then I move into dipthongs (ow/ou/aw/au/oi/oy/ew/oo). Near the end of the year I focus on other things, like contractions and compound words. Depending on the group of students, I might also introduce the endings -tion and -sion, but not necessarily. I never give up the basic letter sounds, I just add to them. Now, I am not an expert on phonics instruction, but this is what has worked for me! I find the key is repetition, repetition, repetition! A lot more goes into our phonics instruction... we do independent work, we play fun activities at starfall.com on the Mimio, we do some phonics word work activities during Daily 5, and we do some reinforcing/reteaching during our guided reading lessons as well. 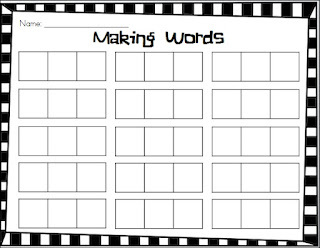 I also created a little recording sheet for students to record words we have made. You could also put a set of the phonics cards into a station and let students make their own words! Click the picture to download your own recording sheet. Well I hope this has been interesting/informative/something to think about... How do you teach phonics? Do you use a specific program or have your own order? 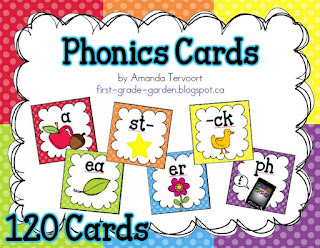 I love your phonics cards and just added them to my cart:) We use the routines in Making Sense of Phonics to teach our K and 1st gr2ade students. I have a question for you. Are you implementing CCSS? We are and that means that our K students are now working on silent e. By the end of the 1st marking period in 1st grade our kids need to be able to spell and read words with the silent e rule and need to spell and read other vowel patterns by the end of January. Will this effect your timeline? I purchased the cards and love them. Can't wait to laminate them! I like your progression better than ours. We do short vowel review, beginning blends, ending blends, sh, th and right into long vowels. The beginning blends and ending blends are supposed to be done in two weeks. I usually have to slow that down. A lot of them don't really know the sounds like they're supposed to and then I'm supposed to start long vowels in the beginning of October? I like your cards. Very cute. Thanks so much! I really spend a lot of time focusing on the alphabet sounds and short vowels... I feel like they need to have a solid grasp on those before moving onto the other sounds. Can you tell me where you took the workshop, or a website for finding out how to get an inservice? It sounds great!